Andaman Discoveries can arrange hotel accommodation in Kuraburi as well as such popular Southern Thailand destinations as Khao Lak and Phuket — we have options to meet any budget and taste. For village tours, we highly recommend staying with a host family in a homestay. Staying with a family allows you to take a privileged look into their lives and really connect with the villagers. Contact us and we can help tailor the perfect package for you. We want to make sure your trip to the area is an enjoyable one! from 700 THB ($23 USD) a night. Nestled in a beautiful garden by the Nangyon River, the Resort lies in the center of Kuraburi town. Spacious porches adorned with orchids are the perfect place to relax and watch the river. 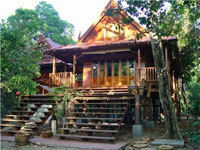 There are several comfortable fan and air-conditioned bungalows spread out over a wooded area along the river. Each bungalow has been given the name of an orchid, expressing the ancient relationship between these plants and Thai people. from 770 THB ($25 USD) a night. 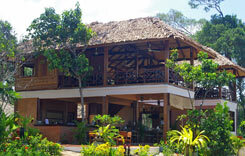 Located in the center of Kuraburi town, Boon Piya Resort is excellent value for money and convenience. Their rooms have porches that face nicely landscaped grounds. Their rooms are clean, well equipped with TV and towels, air conditioning and hot water. Some guests have mentioned that the beds are quite hard, but that might be better for you! The owner, Ger Hui, speaks great English and offers laundry service as well as motorbike and truck rental, all reasonably priced. from 1,900 THB ($64 USD) a night. This delightful resort is nestled in lush green surroundings 12 kilometers from Kuraburi town center, by a beautiful lake. Complete with swimming pool, restaurant serving international and Thai cuisine, massage service and gift shop, this resort is the most luxurious place to stay in the area. Rooms and villas are air conditioned with novel waterfall-style hot showers. The staff is friendly and speaks fairly good English. Food is a little bit more expensive than other places and made for the Western palette. Make sure to tell them if you don’t like your food spicy! from 2,900 THB ($97 USD) a night. Located in the pristine natural surroundings of Prathong Island, one of only a few hidden islands still remaining. For environmental sustainability, all of bungalows use solar panels to create electricity without disturbing the environment. 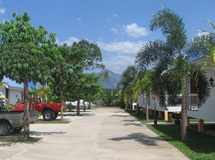 The main structure of bungalows are built with local natural materials. 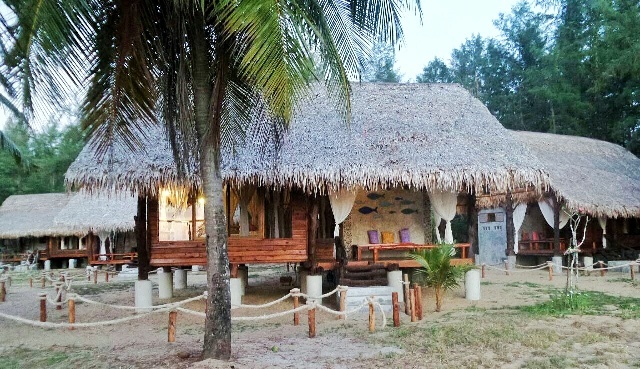 The resort features eleven styled bungalows, each room is inspired by the unique history of Prathong island and designed to highlight one of the island’s natural wonders. from 1,600 THB ($54 USD) a night. Located on the remote island Koh Prathong, Horizon Eco Resort is an excellent value for money and convenience. They have a great restaurant on the beach with an excellent meals offer stunning views over Prathong bay and a great place to enjoy the sunset on the beach. from 3,200 THB ($106 USD) a night. This idyllic eco-resort is located on a 10-kilometer stretch of deserted beach on a remote island, a popular place for yoga retreats and nature lovers. It remains one of the only unspoiled coastal areas in Thailand affording you a holiday completely in touch with nature. Each of only 25 houses is uniquely designed and constructed using locally sourced and renewable materials. 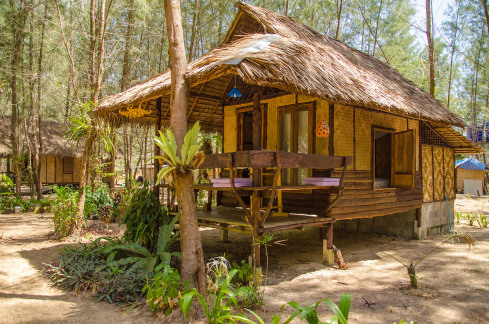 The traditional Thai-style houses are beautifully decorated and surrounded by natural vegetation. Hornbills and monkeys are a popular sight and eco-tours can be arranged. from 1200 THB ($45 USD) per night, Jungle houses. 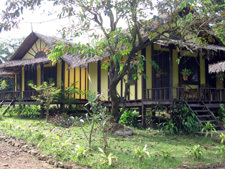 Khao Sok Riverside Cottages offer a perfect, private paradise. Enjoy being a 5 minute drive from the busy shops and tourist traps of nearby Khao Sok village. You will wake up to the sounds of birds chirping. Soak up the sun as you relax on the lawn and river beach, go for a swim, and look for wildlife on the opposite bank. When you’re ready, explore the river by canoe or hike into the jungle, or head into town on the daily shuttle. Khao Sok Riverside Cottages are all-wood Thai-style accommodations that offer the perfect mix of comfort, cleanliness, and natural beauty – with new mattresses, elegant furnishings, and a private deck overlooking the river and jungle of Khao Sok National Park beyond. 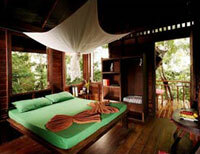 from 2200 THB ($75 USD) per night, luxury tree houses. The Jungle Tree Houses are situated in one of Thailand’s best preserved habitats for tropical vegetation and wildlife, surrounded by majestic limestone cliffs. Great care is taken to use local materials and craftsmen and ensure minimum impact on the local ecology. These unique examples of Khao Sok accommodation are blended into the forest so that you can experience a diversity of wildlife whilst enjoying the luxury of these wonderfully constructed tree houses living at one with nature. 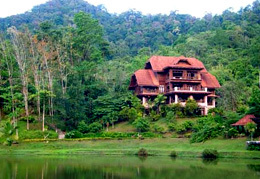 They offer rain forests treks, kayaking, and an overnight raft trip on a lake in the middle of the jungle. Children and adults of all ages love to stay in the tree houses built into 100-year old hardwood trees.